365 Project – Day 352 – When Did Your Parents Fall Off the Cool Train? A funny thing happens between childhood and adolescence. No, I’m not talking about hormones or growth spurts or hair beginning to sprout in strange new places because, let’s face it, none of those things are really all that funny. In fact, at the time, any one of those experiences can make you feel like you want to crawl under your covers and not come back out until all your acne has cleared up or you’ve gotten your driver’s license. At least if you’ve got your driver’s license, you look a whole lot cooler than all the kids who don’t. To be honest, there’s not a whole lot to laugh about when it comes to adolesence. It’s just a rough existence. And to make matters a whole lot worse, there seems to be some direct correlation between entering adolescence and your parents making an abrupt (and sometimes very public) exit from the Cool Train. I remember the day it happened for me. My family was vacationing in Texas visiting my Uncle Harry and Aunt Jean. We headed out to Chili’s for a bite to eat. After placing our drink and appetizer order, we were just sitting around the table making small talk. Like most restaurants, there was some music playing in the background. We weren’t really paying much attention to it, that is until Elvis’ “All Shook Up” came on the radio and my Dad grabbed the ketchup bottle from the middle of the table, held it up to his mouth, and started singing along. Right there in the middle of the restaurant. For a moment, it was funny. You know that moment when you’re so surprised by the ridiculousness of it that you have to laugh. I even snapped a picture (which is currently packed away in a box somewhere, dammit). But then, the funny wore off and Duane kept right on singing, loud enough that other people in the restaurant could surely hear him. My sister, Lindy, had already left the table and parked herself in a nearby booth. She was a year older, and our parents had fallen off her Cool People List a long time ago. I think my sense of humor kept me laughing at the things that might embarrass most other children, but not that day. That day, I hurried away to join my sister at her table, leaving Dad to finish his impromptu karaoke with the other adults who didn’t seem the least bit bothered by it. Now that I’m an adult and I have a daughter of my own, I find myself thinking about these little episodes from my past, and wondering when I’m going to take an unexpected nosedive off of Cadence’s Cool Train. And when is Steven going to go? Before me? After? Will we dive off together in fiery blaze of embarrassing glory? Who knows? Maybe we won’t. Maybe we are just eccentric enough already that Cadence will be able to shrug off our antics and chalk it up to the fact that her parents are just a little strange. I guess we’ll have to just wait and see. And I’d like to share the photo that got me thinking about all of this tonight, and remembering my father’s ketchup bottle serenade. 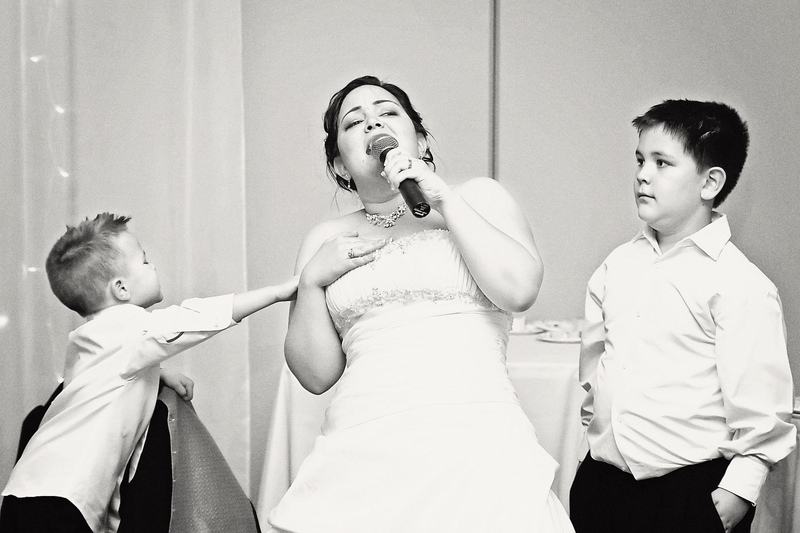 As I worked on more wedding photos today, I came across this one of the bride serenading her sons. While her youngest was loving every minute of it and pleading to do a little singing himself, her oldest son just had the funniest “Oh my gosh what is she doing! ?” expression. Yeah, she just might have taken a tumble off the Cool Train, but what a wonderful way to go, don’t you think? Next Entry 365 Project – Day 353 – How Am I Doing?